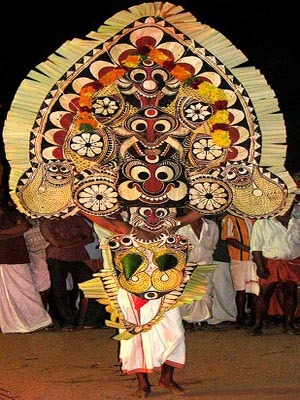 Padayani also known as Padeni is a traditional folk dance of Kerala India. It is an ancient ritual performed in Bhagavati temples. Padayani is an art form that blends music, dance, theater, satire, facial masks, and paintings. It is part of worship of Bhadrakali and is staged in temples dedicated to the goddess from mid-December to mid-May.Kalan Kolam is the major attraction in padayani. This is about a child who is begging his life to lord siva while death comes in his 16th birthday. Padayani was performed by magico-medicine men of Kerala to heal the illnesses not amenable to medical modalities of intervention.It is believed that it is evolved from a symbolic past reminiscent of fencing march of martial art Kalari. Eventually in Kollam, Pathanamthitta, Alappuzha and Kottayam districts of Kerala, the Nair folk became the performers of the modern form of Padayani art, but the design and making of costumes vested with Kaniyar people. Padayani is very popular in Kerala, India, as a means, used to worship goddess kali.The story line comes as after killing daruka, an asura, goddess was in anger. A major attraction of padayani is the song associated with it. Traditionally only a single type of instrument is used to associate the song, thappu. The songs are in simple malayalam and have been handed down from the ancestors over the years.The instrument is faced towards the fire and the instrument tuned. After that, the art form starts. Various types of dances have different names such as madan, marutha, yakshi, pakshi, kalan kolam and bhairavi kolam.